The Challenger Track is a simple track which heads through the heath and some forest to arrive at a pleasant lookout. 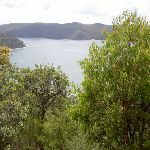 Starting at West Head Rd, the track follows a ridge out to a rocky outcrop where views over the Hawkesbury River and Broken Bay reveal Patonga and Brooklyn. 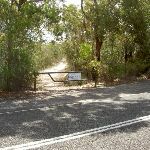 From the intersection, the walk heads past a gate and an information sign. 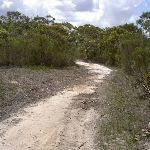 The trail tends right, up the hill, continuing to wind as it undulates for approximately 1km through the heathy bush. 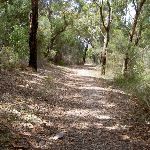 The walk then rises and swings into a shady eucalypt forest, continuing down the hill to the end of the wider trail. Veer left: From the end of the trail, the walk heads through the bushes towards the valley and river. 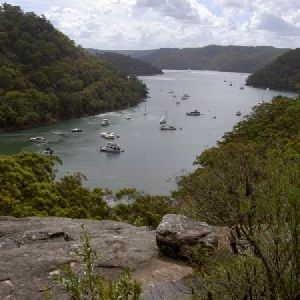 The track leads onto a rock platform overlooking the Hawkesbury River. This whole walk, 1.5km follows a formed track, with some branches and other obstacles. This whole walk, 1.5km has limited facilities (such as not all cliffs fenced). A list of walks that share part of the track with the Challenger Track walk. A list of walks that start near the Challenger Track walk. This walk takes one of two main tracks down to Mackerel Beach. The track leaves West Head Rd, passing some historic Aboriginal engravings before descending to the beach. 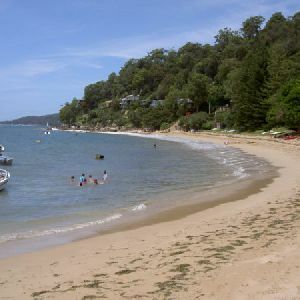 The track loops around the small community of Mackerel Beach to come back down the beach and return to West Head Rd. A nice An optional side trip to Currawong Beach makes a nice addition to this walk. 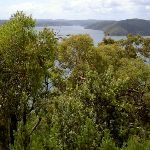 This walk is a great way to see some popular areas in Ku-ring-gai Chase National Park. 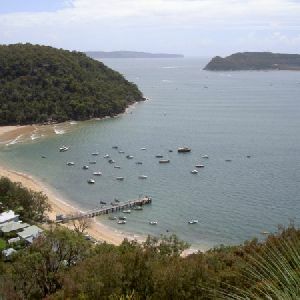 The walk from West Head Rd travels to The Basin campsite, and the ferry takes you over to Mackerel Beach. Before returning to West Head Rd, the walk also gives the option to head down to Currawong Beach. There is plenty to do at the beach, with swimming and picnic areas, and clearings for other games. 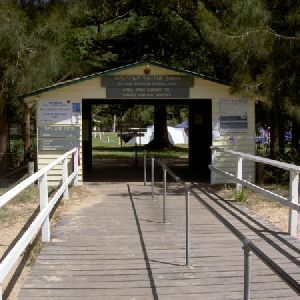 The Basin Track is the only land access to The Basin, Ku-ring-gai Chase National Park’s only campsite. 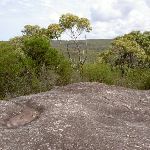 The walk follows mostly management trail and heads across the plateau away from West Head Rd, with a great side trip to Aboriginal rock engravings and The Basin Dam. This is a nice walk, heading through the heath of the plateau and down through the forest to the large campsite and facilities of The Basin. The Basin itself is a great place for a swim or overnight stay. There is a ferry service from the Basin. This short walk has a great range of scenery, making it a great choice if you have only a short time in this National Park. This track one of two ways to access America Bay – the other is by boat. 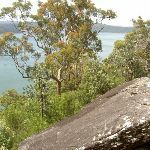 The track cuts straight through the bush from West Head Rd to pass historic Aboriginal engravings and a large cliff with a small waterfall, which also gives an impressive view of the bay. 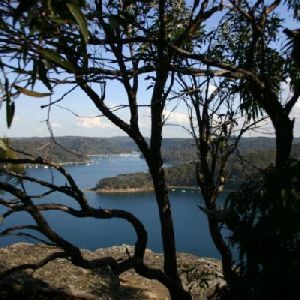 This short walk is a great way to see a slice of what Ku-ring-gai Chase National Park has on offer. The track visits some historic Aboriginal engravings, and enjoys water views, heath and forest environments. The America Bay track also throws in a waterfall for your enjoyment – from the top of the fall, walkers won’t see much of the fall itself, however the outlook is lovely and the walk very enjoyable. 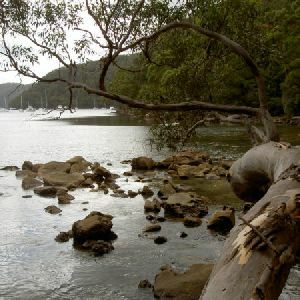 This scenic walk gives an excellent excuse for a ferry ride in Sydney’s northern beaches region. The ferry leaves from Palm Beach Ferry Terminal, and crosses Pittwater to The Basin Wharf. The walk then heads around to Mackerel Beach and passes an optional side trip to some historic and interesting Aboriginal engravings. The scenic water views are complemented by the on-water views from a second ferry back to Palm Beach from Mackerel Wharf. 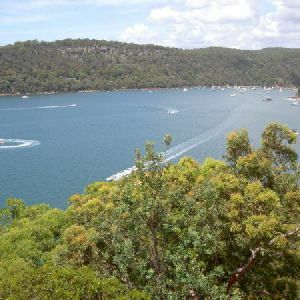 This walk is another great walk in Ku-ring-gai Chase National Park, accessed by ferry. 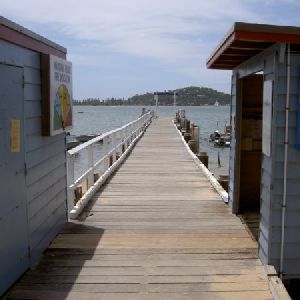 From the Mackerel Beach wharf, this walk uses the Resolute Loop track to round the headland, enjoying a few secluded beaches and excellent, historic Aboriginal sites. This walk features Mackerel Beach and community, with an alternative route through the town which is well worth the walk. 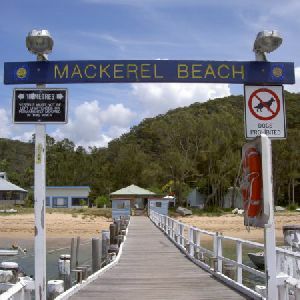 This short walk is a great way to see the beautiful Mackerel Beach and community. After a short ferry ride from Palm Beach, the walk heads up the grassed streets of Mackerel, leading to the lagoon. 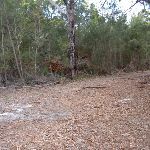 The track is mainly sandy beach or grass stretches, with the area behind the lagoon winding through a bushland area to bring the track back to Mackerel Beach. This loop is a great short walk, and only a hop, skip and jump away from Palm Beach. 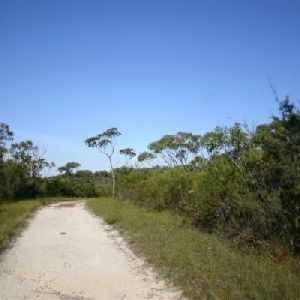 This relatively flat walk takes you through some woodland forests, open shrub and rock platforms to a lookout. 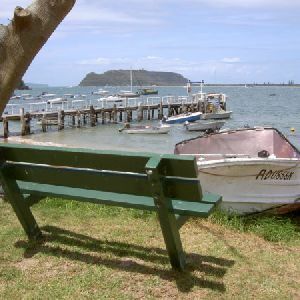 There are great views over the Basin, and out to Narrabeen and north up the Pitt Water. The track is well defined, and the views are well worth the walk. This relatively flat walk takes you through some woodland forest, open shrub and rock platforms to a lookout. The views look over Narrabeen and along Pittwater. The track is well defined, and the views are well worth the walk. This is a pleasant walk along an old management trail, off West Head Rd. 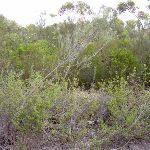 Following the ridge top you will pass through a variety of vegetation types including some dense heath and some tall scribbly gums which occasionally give way to a wide view over the park. There is a nice lookout at the end of the walk with views to Cowan Waters, through the trees. 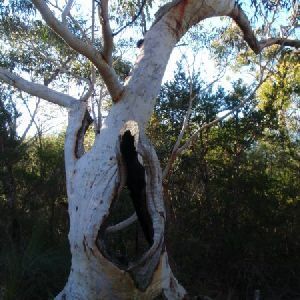 http://new.wildwalks.com/wildwalks_custom/includes/walk_fire_danger.php?walkid=nsw-krgcnp-ct Each park may have its own fire ban, this rating is only valid for today and is based on information from the RFS Please check the RFS Website for more information.